Martinis and olives are a classic duo, but choosing the right type of olive is essential. An olive’s brine and acidity give vodka or gin a slight flavor pop—like adding a small amount of sea salt to complete a dish. 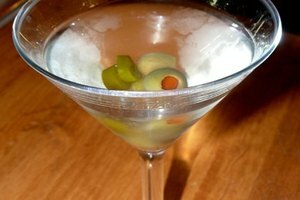 The martini is believed to have originated in the historic California town of Martinez during the Gold Rush era. Olives are an important component of 19th century Mexican-American cuisine and were often served in beverages as well. There are still saloons in California that serve an inch-deep layer of stuffed green olives in every pitcher of draught beer. Fresh or recently preserved. Olives from an old jar may have softened in the brine and become too salty or pickled. Preserved in brine, not in oil, which leaves a greasy film and interferes with taste. Firm, but not too crunchy. Kalamata and Sevillano olives may be too soft. Green, traditionally—but some people prefer the sweet, smoky flavor of a black olive. Black olives tend to be softer, so be careful to choose fresh or recently preserved olives. On the small side. 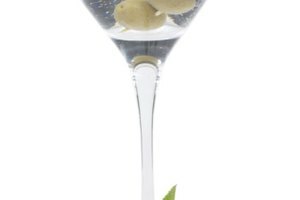 While some people like large olives, smaller olives are generally both riper and firmer, are more visually pleasing in a standard cocktail stem, fit easily in threes on a toothpick, and are easier to eat while still conducting polite conversation. Olives stuffed with goat cheese or blue cheese are an interesting option, but firm cheese is best to avoid gummy bits or a milky sediment in the drink. Cheese-stuffed olives should be chilled before serving. Other olive stuffings that pair well with gin and vodka martinis include garlic, onion, anchovies, almonds, lemon rind, or various sweet and hot peppers, including pimiento. Each type gives the delicate liquor a distinctive spin and flavor. Spear 1 to 3 olives crosswise on a decorative toothpick. Rinse the olives briefly to remove excess brine and any loose bits of herbs or spices. Serve either in the cocktail, or laid across the top of the glass. To have a little fun with stuffed olives, serve three different kinds on one toothpick. 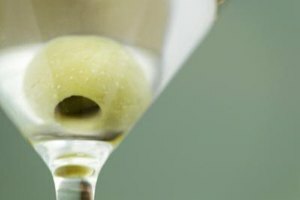 A dirty martini calls for a small amount of olive juice or brine. The best choice would be a bottle of actual pressed olive juice made specifically for cocktails. Brine from a jar of pickled olives works too, but taste it first to see how sour or salty it is. 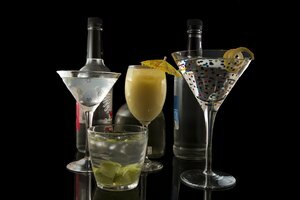 Both gin and vodka have light, delicate flavors that can be easily overwhelmed with too much salt or vinegar. When in doubt, add half the amount recommended by the cocktail recipe, taste, and then adjust. Before adding olive juice from a jar, strain it briefly through a fine cocktail strainer or a small square of cheesecloth to catch any stray bits of spices and herbs. If you want a little zip in your dirty martini, try using pepperoncini juice instead of olive juice.